Goldfinger’s 2018 Junior Mining Tax Loss Season Shopping List | Energy and Gold Ltd.
After beginning 2018 with great optimism and a strong rally right out of the starting gate, the junior mining sector has fallen on hard times. The TSX-Venture Composite is the worst performing global stock exchange of 2018 with a nearly 30% year-to-date loss. Optimism has given way to pessimism and despair with much of the recent trading volumes characterized by sellers hitting bids while buyers cancel buy orders or lower bids in an effort to pick up shares from desperate sellers on the cheap. Whenever a decline begins to accelerate on waning volume it’s a sign that the bulls have simply exited the building. This is the case with TSX-V listed junior mining stocks right now. This tough year in the junior mining sector offers opportunity in the final month of the year to investors who have some dry powder to deploy in beaten down shares of companies with great stories, many of which have considerable news flow in the pipeline over the next few months. I have put together a list of 8 stocks (all of which I own personally) that met a set of criteria including strong insider ownership, projects that could be attractive acquisition targets in any sort of normal resource sector environment, and management teams that have a track record of success. Moreover, all of the stocks on this list are down on the year and some are down considerably (~50%) which makes them targets for uneconomic tax loss selling from shareholders who have run out of patience or simply need to offset some gains elsewhere (cannabis, etc.). Please forgive me if I didn’t include “your” favorite stock on this list. This list could literally include hundreds of stocks given the year we’ve had in the TSX-V, however, these are all companies that I know intimately, have confidence in, and which I believe can all be multi-baggers in 2019. Adamera Minerals (TSX-V:ADZ, OTC:DDNFF) – Adamera has recently caught a quick double after reaching 52-week lows at C$.035 per share. ADZ is currently drilling at its Overlook target in Washington state and the company is also expecting assays from a promising hole that was drilled at its Lamefoot target (rushed assays). ADZ’s Chairman (Yale Simpson) took down C$30,000 of the company’s recent C$365,000 private placement and he also exercised C$60,000 worth of out of the money C$.10 warrants. It was the exercise of the warrants which really caught the market’s attention because he didn’t need to do this – it seems that Mr. Simpson is sending a message to the market that Adamera is really on to something and he’s willing to put his money where his mouth is. Even after its recent rally Adamera has a relatively modest market C$12 million market cap which could easily jump to C$30-$40 million in the event that assays indicate that the company is having success with the drill bit. Alexco Resources (TSX:AXR, NYSE:AXU) – Alexco is a first class silver developer that is within a year of entering commercial production at its Keno Hill, Yukon silver project. Alexco is extremely leveraged to the price of silver. Alexco is expecting its PFS to be completed and released at the end of Q1 2019, Bermingham permit at the end of Q2 2019, and a production decision to be made during the 2nd half of 2019. Alexco is being conservative with these timelines and they expect to meet all of them. AXR currently has about a C$4 million annual corporate overhead, with about C$14 million in the bank right now. Alexco has been offered multiple offtake financing agreements from smelters, multiple $10 million offers, but haven’t decided on any of them yet. They are keeping their options open. After its recent decline AXR’s market cap is currently C$110 million and AXR easily has C$100 million worth of infrastructure in place (replacement cost) at its Keno Hill Project. I believe this stock is trading at a deep value due to a combination of the market’s bearish outlook for precious metals and tax loss selling which has accelerated in recent weeks. A rise up to even US$16-$17 silver would result in extremely profitable production once Alexco moves into production at the end of next year. The bearish scenario would be that silver drops even further and the company might end up pushing out production and burning cash (albeit at a slower rate) until prices improve again. Alexco has a very desirable silver concentrate which smelters really want, which means Alexco is likely to get very favorable terms once they can deliver the concentrate. Infrastructure is very good in the area with road access right up to site and plenty of power as well. If there was ever a “call option” on silver it would be Alexco Resources’ shares right now, AXR offers tremendous leverage to upside in silver. Banyan Gold (TSX-V:BYN) – Banyan is a Yukon gold explorer with two primary projects: The Hyland Gold Project and the Aurex-McQuesten Project (AurMac). Hyland, Banyan’s flagship project, boasts a 524,000 ounce 43-101 compliant near-surface oxide gold resource. Hyland is envisioned to be an open-pit heap leach project in an area of the Yukon with excellent infrastructure. This makes the economics much more compelling than they would otherwise be at a .85 g/t Au-equivalent average grade. Banyan’s #2 project, AurMac, is located in the Keno Hills district of the Yukon and it is surrounded by much larger developers, Alexco and Victoria Gold. Banyan recently announced promising exploration results from AurMac which included a 113 meter intercept grading .74 g/t Au. CEO Tara Christie pointed out that Banyan continues to demonstrate the potential for a near-surface gold-mineralized target with economic potential considering that Victoria Gold’s average grade at its Eagle Project is .67 g/t Au. Banyan shares have been sold down simply due to a lack of interest in lower grade gold projects regardless of their size or location. At its recent C$.04 price Banyan’s market cap is below C$5 million, less than many shell company market caps currently on the TSX-V. Banyan has roughly C$500,000 in its treasury and a C$300,000 annual burn rate. This is a stock that could literally triple on any positive news or a turn for the better in the junior mining sector overall. Banyan is by far the lowest share price and lowest market cap stock on this shopping list which I believe gives it potentially the most upside on a percentage basis. We have seen companies reach C$50 million market caps on “core visuals” with no assays and projects that haven’t seen any real exploration work. This makes Banyan’s C$4 million market cap all the more puzzling considering that Hyland is a very real project that has seen a considerable amount of quality exploration which has delineated a significant near surface oxide gold resource. It feels to me like Banyan is on the cusp of really catching the market’s attention and there is no doubt that some tailwinds in the junior gold sector would make that happen a lot faster. Eastmain Resources (TSX:ER, OTC:EANRF) – While Eastmain shares may have risen roughly 50% recently they are still down about 30% year-to-date and undoubtedly have been the recipient of some tax loss selling pressure during their recent rally. Eastmain is a very interesting story with 3 primary projects in the James Bay region of Quebec (Eau Claire, Eastmain Mine Project, Eleonore South). The Eau Claire Project is impressive with nearly one million ounces measured & indicated at an average grade of 6.18 g/t gold in addition to an additional 500,000 ounces grading 6.53 g/t gold in the inferred category. Percival Prospect on the Clearwater Property. This property is 100% owned by Eastmain and also holds the Eau Claire project which is currently undergoing pre-development activities. Moni Prospect on the Eleonore South JV property. This property is a joint venture with Eastmain (36.7%), Goldcorp (36.7%) and Azimut (26.6%). Eastmain has completed all drilling from the fall program at Moni and will be issuing a press release with exploration results within the next few weeks. The Percival Prospect at Clearwater is what has gotten the market a little bit excited in recent weeks. However, Eastmain has two projects (Eau Claire and Eastmain Mine Project) that contain more than 1.7 million 43-101 compliant ounces grading more than 6 g/t gold. A significant discovery at Percival would be the icing on top of an already sweet cake at Eastmain. In a healthier market environment for the gold exploration & development sector ER shares would be given a great deal more value for Eau Claire and its projected 12 year mine life at nearly 100,000 ounces per year of gold production. Eastmain shares are cheap on a price/NAV basis (.15 x NAV vs. .4 x NAV average among developer peer group) with a couple of potential major catalysts over the next couple of months including exploration results from Percival and Moni. Excelsior Mining (TSX:MIN, OTC:EXMGF) – Fully permitted copper developer in Arizona that is set to be in commercial production by the end of 2019. What is 24 years of commercial copper production (total life-of-mine production of more than 2 billion pounds of copper) at a US$1.23 all-in sustaining cost worth? According to Excelsior’s feasibility study assuming a US$2.75 copper price and a 7.5% discount rate it’s worth more than US$800 million. At Excelsior’s current share price its market cap is less than 20% of the NPV(7.5) of its Gunnison Copper Project – this is a very steep discount for a company that is fully permitted and about to enter the project construction stage. As Excelsior progresses to production I expect this valuation discount to narrow. While Gunnison isn’t a massive copper project in terms of total copper pounds or annual production it is a very profitable project and that is all that matters at the end of the day. The days when mining companies vie for massive projects at all costs (huge capex bills and higher operating costs) are over and as we’ve recently seen with the Barrick/Randgold consolidation, profitability is back in vogue. 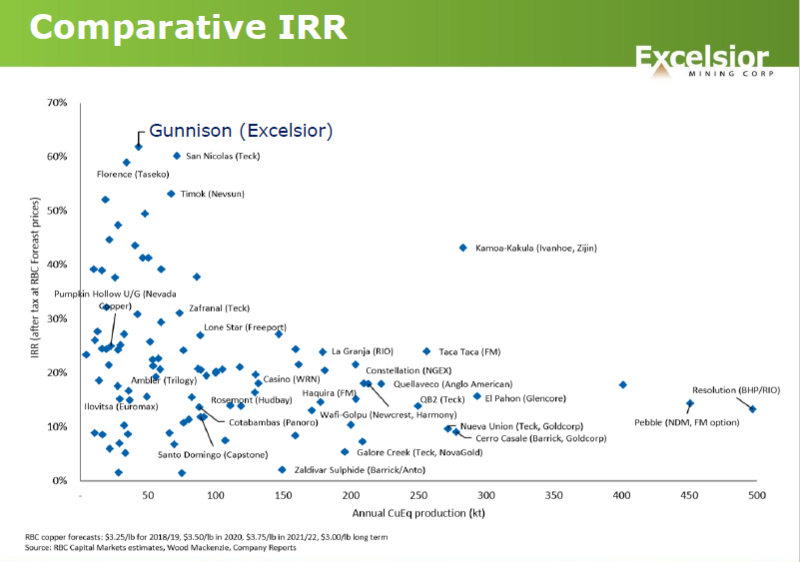 Gunnison offers one of the best after-tax IRRs of any copper project in the world. Excelsior plans to close its project financing this week and get underway with project construction before year-end which would put them on track to begin commercial production in Q4 2019. Fireweed Zinc (TSX-V:FWZ, OTC:FWEDF)– Fireweed’s 2018 drilling program at MacMillan pass demonstrated a few key things: First, it showed that the known zones can grow and do so without grade reduction (maybe even with grade increase), and second that other zones outside the resource including End Zone and Boundary Zone have lots of potential to move the resource in large leaps. In addition, regional exploration has proven up some very intriguing targets that increase the credibility in calling it a “district”. Fireweed is cheap considering the size of the MacMillan Pass Project which boasts more than 50 million tonnes grading nearly 10% zinc-equivalent. This is nothing to sneeze at and by all indications this project will grow even larger after Fireweed’s 2018 exploration program delivered some promising step-out holes including a blockbuster step-out at Tom East grading 21.1% zinc, 13.5% lead and 243 G/T silver over 16.4 meters. Fireweed has an extremely tight share structure with less than 32 million shares outstanding and a fully-diluted share count of less than 40 million shares. This means that at its most recent share price of C$.90 FWZ has a sub-C$30 million market cap – an absurd market cap for a company that has the largest zinc-lead project in the world held by a junior. Using South32’s US$1.3 billion acquisition of Arizona Mining earlier this year as a benchmark, (MacPass is almost the exact same zinc-equivalent grade of the Taylor Deposit while being slightly more than 1/3rd the size) it’s not hard to see that Fireweed shares are substantially undervalued. Gold Standard Ventures (TSX:GSV, NYSE:GSV) – GSV shares have been hit hard in recent weeks, far harder than the junior gold sector as a whole; GSV shares are down ~40% since their early October peak at C$2.39. 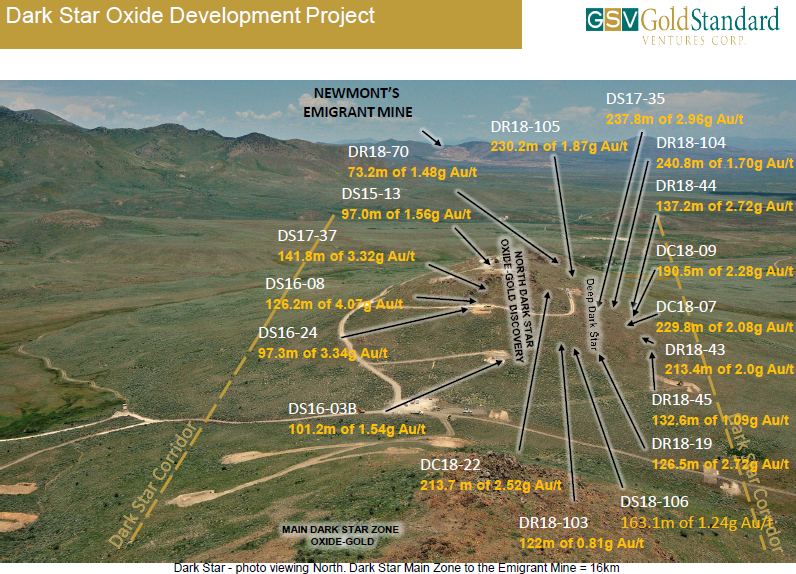 In my estimation it’s not too much of a stretch for GSV to reach a 5 million ounce global resource estimate at its Nevada gold projects and considering that most of its ounces are of the near surface oxide variety they are likely to command a healthy premium to any potential acquiror. How much are 5 million ounces of open-pit heap leachable ounces worth in Nevada? Even if we use an extremely conservative US$100/ounce estimate we get a US$500 million market cap for GSV (not giving credit for GSV’s C$20 million of cash in its treasury) which equates to a C$2.50 share price (67% above current levels). To be clear I believe US$100 per ounce is a very low valuation for the extremely high quality ounces in GSV’s project portfolio, however, considering the challenging climate in the precious metals sector it’s prudent to be conservative in estimates of potential takeover valuations. GSV CEO John Awde has been an active buyer of GSV shares in the open market and he and his immediate family now own about 2% of GSV shares. Oceana Gold owns 15.6%, Goldcorp owns 13.6%, and FCMI owns 11.7%. In total retail shareholders own less than 20% of GSV’s outstanding shares. C$20,000 worth of insider purchases by GSV CEO Jon Awde in recent days. Awde has bought more than C$100,000 worth of GSV shares since the beginning of November. Klondike just completed their largest exploration program to date with 87 holes totaling roughly 9,000 meters at its Klondike Project in the Yukon. Klondike CEO Peter Tallman is searching for the hard rock source of the 20 million ounces of gold that have been placer mined throughout the history of the Yukon. In this quest for the motherlode Klondike has drilled many impressive intercepts including: 2.4 g/t Au over 37 meters, 2.4 g/t Au over 41 meters, and 1.4 g/t Au over 65 meters. After roughly 25,000 meters of drilling in the last four years Klondike Gold has an ambitious, yet very realistic, plan of delivering a 2 million ounce resource estimate by 2021 after two more seasons of drilling up in the Yukon. Another important aspect of Klondike is its strong shareholder base including Eric Sprott (13%), Frank Giustra (14%), and other management insiders (10%). Klondike checks all my boxes in terms of share structure and strong insider ownership. Moreover, with C$3 million in its treasury Klondike is well financed through 2019 and with a little luck the company will be able to finance itself through warrant exercises in the new year (20 million warrants outstanding at a weighted-average-price of C$.28). At its current share price of C$.18 per share Klondike is being valued at less than C$20 million which isn’t giving the company much credit for the potential of having a multi-million ounce gold project in a top-tier location (less than 20km from Dawson City, Yukon with excellent road access).